When dealing with out of date menus, cafes and restaurants sometimes resort to using white out, scribbling in new prices or just not raising prices at all. Perhaps there are even a few items that should be on your menu, but aren’t, because its been too long since your menu was last printed. 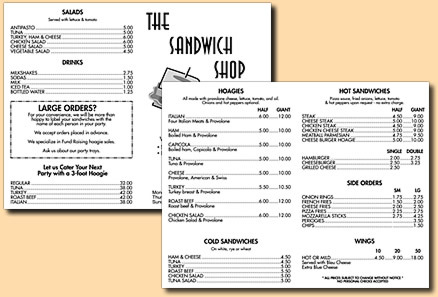 Having Graywolf Designs create new menus, or update your current menus to reflect today’s costs may more than pay for itself in the long run. Your document will be stored electronically making it quick and easy to update in the future.